Unfortunately the truth of the matter is we all consume insect eggs whether we want to or not. 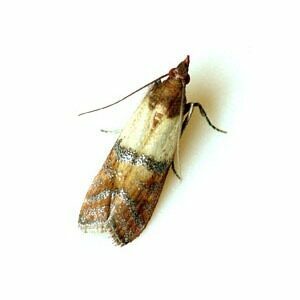 Indian Meal moths are considered a stored product pest. So what does this mean? Food products such as cereals, rice, crackers, seeds, candy, nuts, dry dog food, etc, that sit too long eventually can cause the issue. Either the products sat too long in the store, your home, or a combination of the two. Insect eggs are naturally protected from the insecticide applications applied to our foods and some insect eggs pass through and enter the boxes containing our stored dry foods. Over time the eggs hatch into larva. The larva will then eat its way through the box, eventually will turn into pupa casing. Then to complete its life cycle it turns into an adult Indian Meal Moth. Indian Meal Moth Eggs. These eggs enter our stored product foods and in time will eventually hatch into larva.